For the latest information on this campaign please also see its subtab Status Updates and News and Media/Articles in the navigation menu. Across British Columbia and in particular the Sunshine Coast Timber Supply Area, Douglas Fir are on the verge of liquidation. Finally in 2011, there has been some small progress by the government to recognize the dire situation of the Douglas Fir eco-system being under-represented in the park system and other protected management zones. The lower slopes of Mt Elphinstone are prized for their fast growing Douglas Fir forests. The unbridled commercial appetite for Douglas Fir will turn the vast majority of the lower slopes into industrial tree farms – a situation not conducive to a healthy environment. The current Mt Elphinstone Provincial Park is very small and is divided into 3 separate ‘island’ parcels protecting only 139Ha of lands across the lower mountain slopes, near Roberts Creek, north of Gibsons. The surrounding Crown lands offer high-value recreation, and on-going environmental services in an inter-urban zone. BC Parks states that the Park is “vulnerable to adjacent logging”, is a “minor contributor to the, under-represented, Georgia Lowland EcoSection” and “is a negligible contributor to the, under-represented, Cedar, Western Hemlock Forest Zone”. In other words, the existing park needs expansion to provide viable protection of this vulnerable eco-system. The necessity to expand the Park should be primary over all other development. A moratorium on all cutblocks in the new park boundaries should be implemented immediately to protect the land while park expansion is considered. 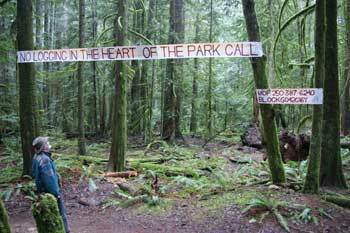 Help Support the Mount Elphinstone Park Expansion. We Need Your Help.